This week, PETE’S BACK! That’s right we do a full on hostful with Ben, Dave, John and Pete! Together they discuss important news like the reveal of the Deadpool costume. Why won’t Dwayne Johnson stop talking about Black Adam and What is the right background music for an evil robot building montage? This and much more in this week’s jam packed Super Hero Speak. Enjoy! #stumpthegeekspeak question of last week: Where and when was the first Star-Lord story published? #stumpthegeekspeak question of the week: When did the Marvel 616 and Ultimate Universes first cross over, and which characters were involved? This week we present to you, your Squirrel Girl, Maggie Mae Fish! OK, maybe Maggie isn’t playing Squirrel Girl just yet, but someday. 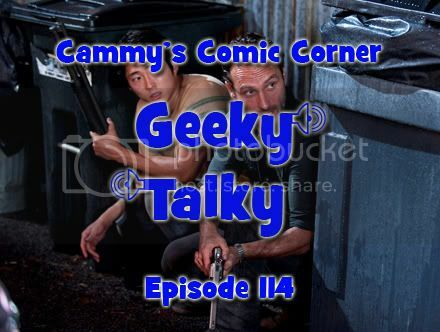 She is however the next installment of #FunnySPEAK, the ongoing segment where we sit down with a stand up comic and talk comics and all things nerdy. Maggie is part of the sketch comedy group Snicker Doodlin and you can catch her live in LA @ The Comedy Store and the Ha Ha Cafe. So sit back and enjoy! #stumpthegeekspeak question of last week: Name the characters and the secret identities of the Smallville version of the Justice Leauge? And the Winner is: Nathan Withrow, congrats you are the Geek of the Week! #stumpthegeekspeak question of the week: Name an actor who has played two different parts in the MCU. Hint not Chris Evans. Comic News Insider Episode 391 – Forsooth! Comic News Insider: Episode 391 is now available for free download! Click on the link or get it through iTunes! Sponsored by Dynamic Forces. Jimmy is joined in studio again by frequent guest co-host and all around good pal Jon Hoche! Jimmy finally joins XBox Live and immediately gets addicted to Peggle. As well as the new Draw Something app on his iPhone. Be forewarned: There’s a lengthy SPOILER FILLED review ofThe Walking Dead season 2 finale. News includes: IDW announces a slew of new titles, will The Ponds survive Doctor Who after all?, Chris Hardwick’s new Nerdist YouTube channel announces line up, Felicia Day’s new Geek and Sundry YouTube channel announces line up, Punisher in Space, new Captain Marvel from Marvel and Brian Wood is all about the X-Men. And for some reason, there’s a lot of Shakespeare influenced stuff talked about this episode. ZOUNDS! As always, listener feedback (with a great guest suggestion), the Top 3 and more! Leave your iTunes comments! 5 stars and nothing but love! Comic News Insider: Episode 368 is now available for free download! Click on the link or get it through iTunes! Sponsored by Dynamic Forces. Jimmy flies solo since he has the plague and doesn’t want to infect any visitors. He talks about being introduced to the awesome artist ChrisCross, Steve Rude’s recent troubles, no more Cloak and Dagger, and the new animated series Kung Fu Panda: Legends of Awesomeness. News includes: Marvel will finish The Twelve, Marvel cancels some series, Brian K. Vaughan to adapt Stephen King work for Showtime, truck full of comics is stolen, PC version of Arkham City game is coming, die as a “Redshirt” in an IDW Star Trek comic, and a Star Wars fan has the weirdest photoshoot ever. As always, Listener Feedback, the Top 3 and more! Leave your iTunes comments! 5 stars and nothing but love! Comics on Comics proudly presents the second half of our most popular episode to date! Host Juan-Manuel Rocha welcomes Jeff Katz (X-Men Origins: Wolverine, Booster Gold), Lost co-creator Damon Lindelof (Ultimate Wolverine vs. Hulk, Star Trek) along with comedians Doug Benson (Super High Me, VH1’s Best Week Ever), Chris Hardwick (Attack of the Show, Web Soup), Jonah Ray (X-Play, The Rotten Tomatoes Show) and Matt Weinhold (G4’s Code Monkeys) for an unforgettable night of comics and comedy coming to you from Meltdown Comics in Hollywood! In this episode, our panel dissects X-men Origins: Wolverine with a spirited defense from Katz and takes a look back at Lindeolf’s Ultimate Wolverine vs. Hulk miniseries before tearing into the Watchmen movie, Hancock, Superman Returns and Freddy vs. Jason vs. Ash before the panel goes in-depth on Robert Kirkman’s incredibly popular zombie series, The Walking Dead! If you want to see the first half of this episode, you can find it here! Comics on Comics presents our blockbuster episode dedicated to the hit TV series Lost several weeks early, because you demanded it! Host Juan-Manuel Rocha welcomes Lost co-creator Damon Lindelof (Ultimate Wolverine vs. Hulk, Star Trek), Jeff Katz (X-Men Origins: Wolverine, Booster Gold), Doug Benson (Last Comic Standing, VH1’s Best Week Ever), Chris Hardwick (Attack of the Show, Wired Magazine), Jonah Ray (X-Play, The Rotten Tomatoes Show) and Matt Weinhold (G4’s Code Monkeys) for a mind blowing night of comics and comedy coming to you from Meltdown Comics in Hollywood! In this episode, our panel delves into the origins of Lost, the unresolved stories of Libby & Mr. Eko, the Lost alternate reality games, the future of Lost in syndication and DVD, the unexplained mysteries of the island and the upcoming final season. Additionally, Lindelof explains the significance of the cursed numbers for the first time in public!